Elephants can recognise their own reflection, showing self-awareness seen before only in humans, great apes and bottlenose dolphins, scientists say. 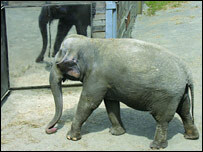 US researchers made the discovery by studying the behaviour of Asian elephants in front of a tall mirror. One of the animals repeatedly touched a white cross painted on her forehead - a classic test used to assess mirror self-recognition in children and apes. The study is reported in Proceedings of the National Academy of Sciences. "We see highly complex behaviours such as self awareness and self-other distinction in intelligent animals with well-established social systems," said Joshua Plotnik, from the Yerkes National Primate Research Center, Emory University, Atlanta, Georgia. "The social complexity of the elephant, its well-known altruistic behaviour and, of course, its huge brain, made the elephant a logical candidate species for testing in front of a mirror." Many animals will respond to a mirror but very few show any evidence that they recognise themselves in the reflection. Canines, for example, will react to the "other dog" and will even look behind the mirror to try to find it. The Asian elephants in this study also displayed this type of behaviour when standing in front of a 2.5m-by-2.5m mirror - they inspected the rear and brought food close to the mirror for consumption. 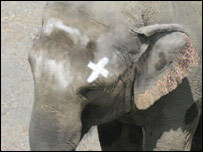 But one of the elephants, called "Happy", went to the next level: she began repeatedly touching a painted "X" on her head with her trunk. The mark could only be seen in the mirror, and the elephant ignored another mark made with colourless paint that was also on her forehead to ensure she was not merely reacting to a smell or feeling. While only one elephant passed the mark-touching test, the researchers note that fewer than half of chimpanzees tested typically pass this test. "Elephants have been tested in front of mirrors before but previous studies used relatively small mirrors kept out of the elephants' reach," said Plotnik. "This study is the first to test the animals in front of a huge mirror they could touch, rub against and try to look behind." Co-researcher Frans de Waal said: "As a result of this study, the elephant now joins a cognitive elite among animals commensurate with its well-known complex social life and high level of intelligence. "Although elephants are far more distantly related to us than the great apes, they seem to have evolved similar social and cognitive capacities, making complex social systems and intelligence part of this picture. "These parallels between humans and elephants suggest a convergent cognitive evolution possibly related to complex sociality and cooperation." 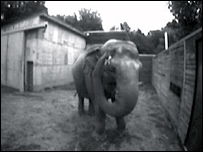 The study, conducted with the Wildlife Conservation Society (WCS), used elephants housed at the Bronx Zoo in New York.